I don’t know what has gotten into me recently. I think it is just pure laziness. I haven’t posted for quite some time and don’t really have any good reason as to why I haven’t. I wish I could say it was because I had been whisked off to some exotic locale, or maybe that I had won an immense lottery jackpot and was busy out spending it all. But no. Nothing like that. Just lazy I think. It’s not like I haven’t been in the kitchen. Oh, believe me I have and I actually managed to get a picture or two. I just haven’t gotten around to writing any of it up. 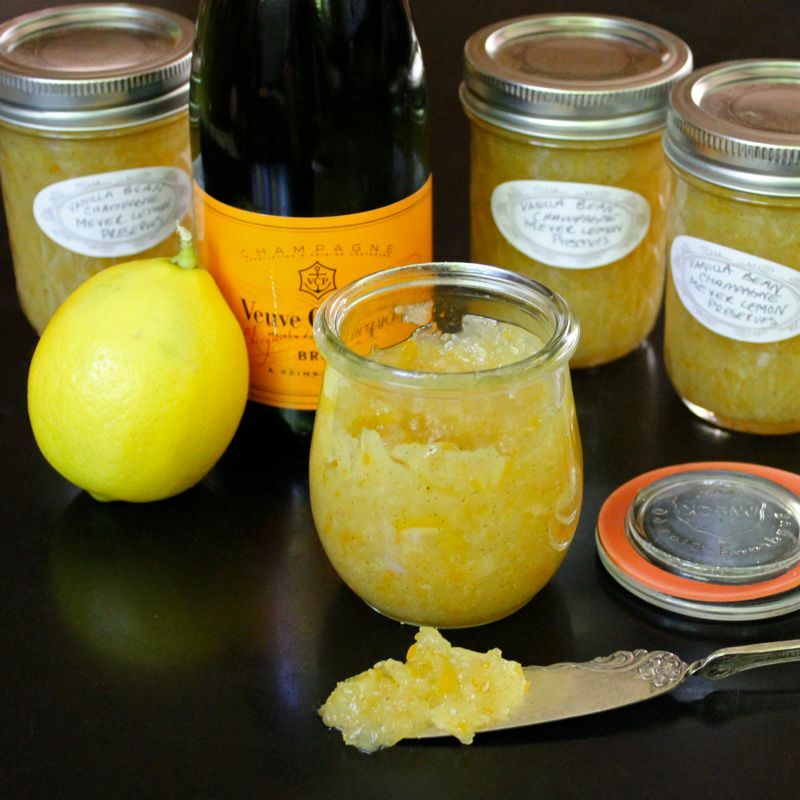 But I woke up this morning and thought perhaps I might want to get with it again, so I thought I’d start with this lovely Meyer Lemon Vanilla Bean Champagne Preserves recipe. Meyer Lemons aren’t available for long in this neck of the woods, so when I spied them in the store a couple of weeks ago I snapped them right up! Meyer Lemons, which originated in China, are a cross between a regular lemon and a Mandarin Orange. This results in a somewhat sweeter, really vibrant tasting lemon without the acidic aspect. They are a gorgeous golden-yellow colour, kind of like egg yolks and have a much thinner skin than regular lemons. I love them and have made quite a few yummy treats with them in the past during their window of availability, like Meyer Lemon Curd and Meyer Lemon Creme Mini Tarts. 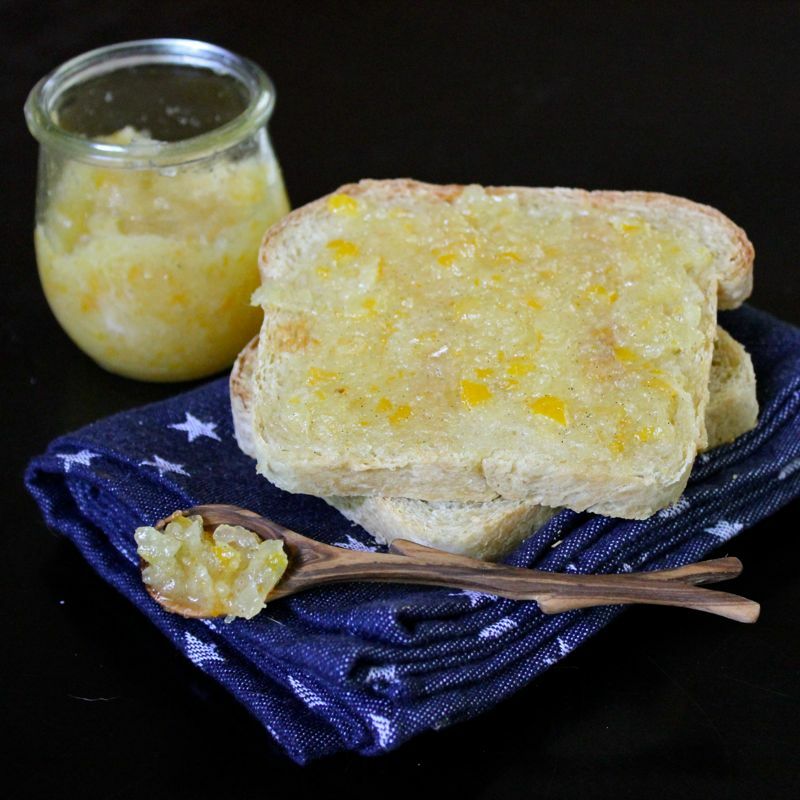 Now I’m sure you can make these preserves with regular lemons if Meyer Lemons aren’t around, but if you can get them, give them a try. Place a small plate in the freezer to test the jam’s consistency later if desired. Fill a large pot with tap water. Submerge three 1/2 pint jars and their lids, making sure they are completely covered by the water. Boil the water. In a non-reactive pan, place lemon slices and cover with cold water. Bring to a simmer and cook for 10 minutes. Drain off water.Repeat this step one more time. Allow lemon slices to cool for several minutes. 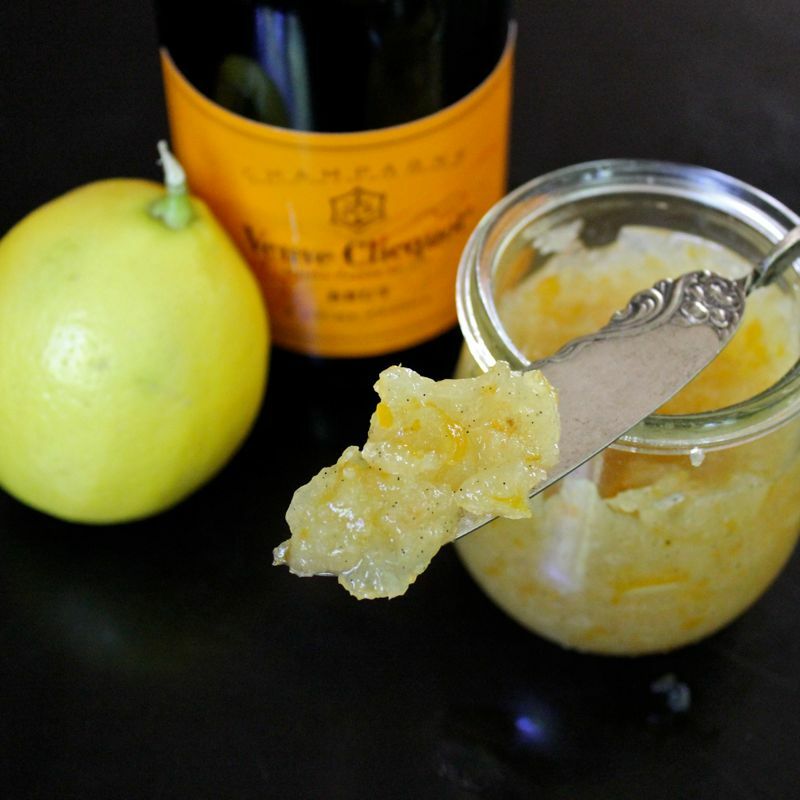 Add 1/2 cup of lemon juice, and 1 cup of champagne and the seeds from one vanilla bean to the pot and bring to boil. Gel point can also be tested by placing a small amount if the finished preserves on a frozen plate. (My preferred method.) If the preserves thicken and wrinkle when you run your finger through them on the frozen plate, it is done. If it remains runny, continue to cook for several more minutes. When the desired consistency is reached, ladle the jam into jars. If your plan is to scarf down all of these preserves immediately, just put the lids on and place the jars in the refrigerator. If you would like to save one or both for later, screw rims onto jam jars. Using tongs, pick up the full jam jars and place them back into the boiling water for 10 minutes. After 10 minutes, remove the jars and place them on the towel. As they cool, you should hear a ping type noise which tells you the jam jars are sealed. When you push down in the center of the top of the jar, there should be no click noise. Make sure the lids are sealed tightly. If you are using Weck jars with a glass lid, once the jar has been filled you place the rubber ring and glass top on the jar and secure it with the metal clips. Process the jar in the hot water bath as described above. Let jar cool completely and then remove the metal clips. If a proper seal has been established you should be able to lift the jar by its lid and the lid should remain firmly in place. If the lid comes off, don’t despair. You’ll just need to store that jar in the fridge and eat it up much sooner than you thought you would be. The preserves can be stored for up to one year. 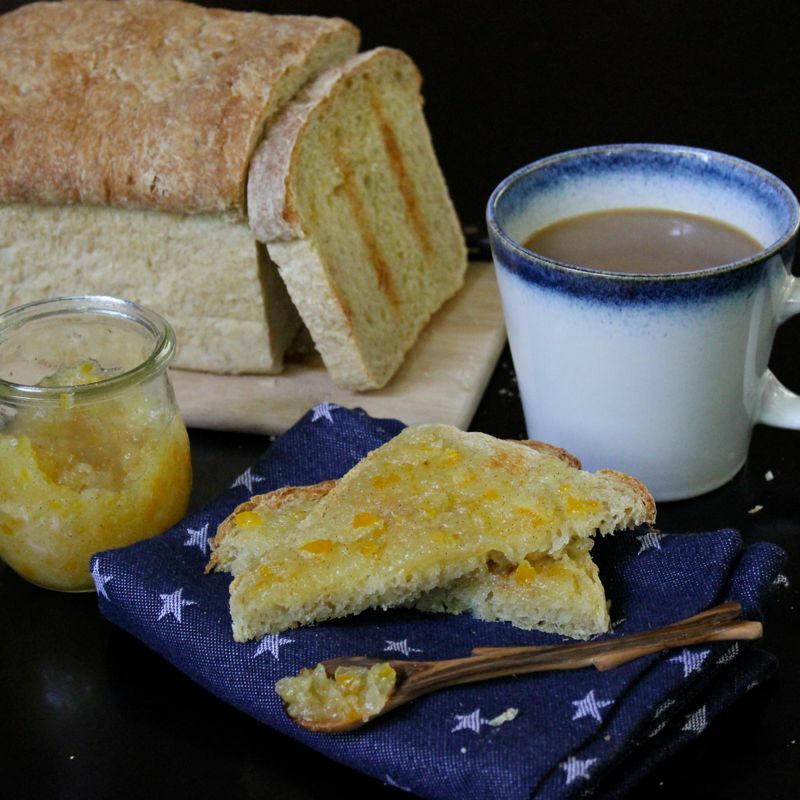 Serve on toast, scones, English Muffins, over ice cream, stirred into yogurt or in a refreshing jammy cocktail! This entry was posted on Tuesday, June 18th, 2013 at 10:25 am and is filed under Jams/Jelly/Conserve, Recipes. You can follow any responses to this entry through the RSS 2.0 feed. You can leave a response, or trackback from your own site. lea! good to see a post from you. I DID think you were off somewhere exotic. The preserves look delish. This looks so good and sounds really refreshing, for a jam. I like that you have so many things that contribute to its light-sounds flavor. I know nothing about liquor – what kind of Champagne do you suggest we use?